Description: the Stegosaurus stands in an active posture, with its body bent, its head and tail pointing towards the left, like it’s defending itself from an aggressor. Its dominating colour is light brown, which is found on its head, sides of the neck, flanks, all of the limbs and both sides of the tail. Its underside (throat, belly and most of the lower part of the tail) is coloured white. The top parts of the animal (top of the head and neck, the back and upper part of the tail, as well as all the back plates) is painted black. On either side of the figure several black shapes stick out of the main black colouring, running over the flanks and tail. The tail spikes are coloured white, while the figure's claws are not painted and it sports small black eyes (with white pupils) and a black JP logo on both upper legs. The Velociraptor stands in a stalking pose, its right arm and leg stretched outward and its head raised upwards with its mouth open, as if it means to jump on something. The tail is raised upwards and bent at the tip. The figure is entirely painted beige, with the lower body parts being only slightly lighter in colour hue than the top parts which appear a bit more brown (especially around the head and neck). A series of thin blue stripes and shapes are found in a random pattern on the back of the head, neck, back, upper legs and front part of the tail. The inside of the mouth and tongue are painted black, while the figure has white teeth and cat like yellow eyes with black pupils. The Raptor sports black claws on its feet (but not on its fingers) and a black JP logo on both upper legs. Analysis: and here's yet another dinosaur two-pack for you. This time the all too often repainted Velociraptor is paired with the less often repainted Stegosaurus, and both sculpts have been done much more justice before. The colour schemes on both figures are rather boring. The Raptor's is undetailed and overly simple, and the way the mouth is painted is just damn ugly. The Stegosaurus is not much better. If you feel the paint scheme looks familiar, you're right, since it appears almost a copy of the one used for the JPD2 Stegosaurus figure, except for the shape of the stripes sticking out of the black colouring and less detail on the plates. The used combination of colours, black and light brown, is also far less inspired than the green, dark brown and yellow combination we saw last time. Honestly, how often have we seen JP dinosaur figures painted in black and brown before? It has become almost a cliché! As for which dinosaur would win in a fight, I'm inclined to bet on the Raptor. It has speed and agility at its side, as well as those nasty claws. The Stegosaurus might do some damage with its tail if it was fast enough, but would most likely meet an untimely end. Repaint: yes. Both figures are repaints of dinosaurs that originally came with human figures for the JP III line. 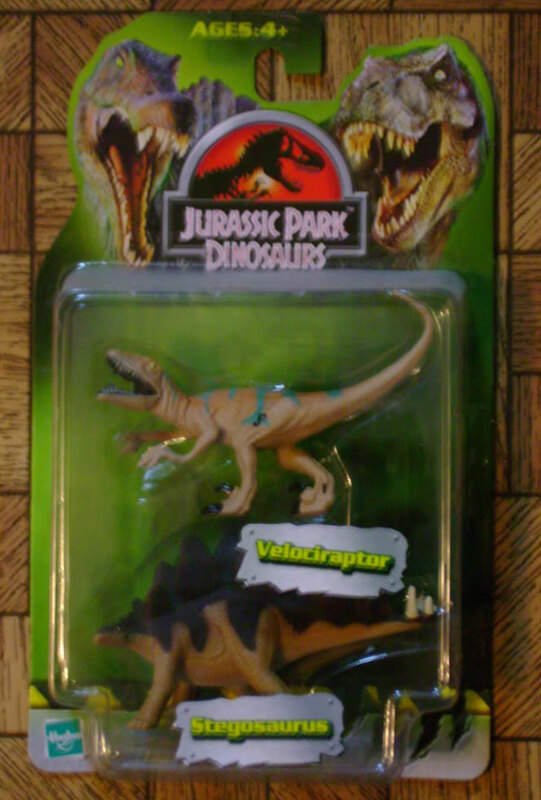 The Velociraptor teamed up with Alan Grant (first wave release), while the Stegosaurus was paired with Paul Kirby. Both figures have been repainted before for JP III Camo-Xtreme and JPD2: the Raptor would be featured again in this toy line, and would also appear in JP 2009. Overall rating: 4/10. There's nothing new to both sculpts, unless you don't own the previous releases yet. Both figures are adorned with dull and uninspired paint jobs, making this one of the less appealing dinosaur two-packs. Like most two-packs from JPD2 and JPD3, this is not a rare set. It can still be found fairly easily, usually for low prices because it's just not very popular or sought after, for obvious reasons.